When I think of tacos I think of a crispy corn taco shell filled with spicy ground beef, topped with lettuce, tomatoes and cheese maybe sour cream and salsa too. I had never had a taco any other way...until recently. And I have to say I have been missing out. While meal planning I was browsing some of my favorite recipe websites. I found this slow cooker recipe and that is why I decided to make it. I love my slow cooker...love love love it! It is wonderful for busy moms :) The chicken tacos turned out wonderful...so tender and NOT dry. I always struggle with cooking chicken because I over cook it. In my opinion slow cooking chicken is the best!! Here is the link, and I am posting how i did it below. I made a few changes. I didn't take photos though, so the pic is from Betty Crocker.com. 2 lbs of bone in chicken thighs. I removed the skin myself. Spray slow cooker with cooking spray or use a slow cooker liner. Place chicken thighs in cooker. Sprinkle with taco season and brown sugar. Mix in green chiles, corn and 1/2 cup of enchilada sauce. Remove chicken from slow cooker and de-bone. I use two forks to shred the meat. 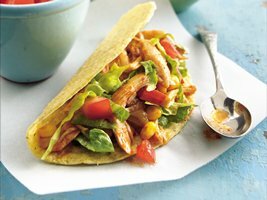 Stuff the shredded chicken into warmed taco shells and top with your favorite taco toppings. yummy!!! i need to remember to add some mexi-corn to my grocery list so i can have it on tacos. these chicken tacos sound and look so good!! oh my gosh...what a crazy coincidence! I just put my "dinner" in the crockpot and guess what, I'm making the same thing! Ha! Not using that same exact recipe though, so hoping it comes out yummy like yours did! Yummy! Tacos are a fave around our house! That sounds absolutely delicious. I've never heard of making tacos like that. I think you just help make some of my grocery list this week! You always have such great recipes and I love that this uses the crock pot. Yum!!! Sounds delicious!! I love using my crock-pot, so I'll definitely write this one down and give it a try!! P.S. How's the house coming along? I'm going to try to do an update next week sometime! Thank you thank you! This is going on next week's menu...I'm a fool for anything Mexican! Yum!